Gardens of Infinity is a website of curated mathematical content, designed to inspire careful thought as well as deep reflection. The user enters an interactive and immersive online environment, is presented with five intriguing statements from Cantor's set theory, and actively navigates and follows where curiosity leads. Each statement is presented with four options: Would you like a short and accessible explanation? Would you like a careful and rigorous explanation? Would you like to read about the story and characters behind this statement? Or would you rather like to ponder, to reflect on what it all means, philosophically and metaphorically? Check it out at: gardensofinfinity.com. 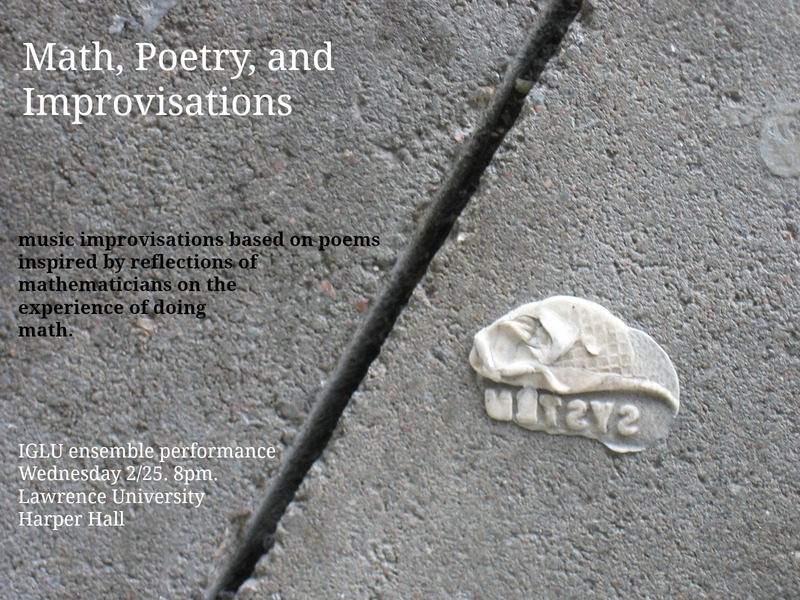 The Lawrence University improvisational music ensemble performed improvisations inspired by poems written by the creative writing club, based on collated responses to a survey I conducted of practicing research mathematicians... about their lived experience of doing mathematics. More info in the program notes. There was also a flyer, and the full concert program. You can listen to the performance on YouTube. At MathFest 2014, in Portland, I organized and ran a free evening workshop, bringing together mathematicians and local dancers for an interdisciplinary collaborative exploration of topological data analysis. After four days, we presented a lecture/demonstration to the public. You can read the workshop description or a flyer for the event, or see some photographs. In 2013 most of my non-research and non-Insight Link projects qualified as Art Collaborations. Here's a defunct preprint that is wrong, but I spent hundreds of hours working on it before I figured that out. RIP. 2 Jul 2011: An argument for "metamathematics"
The goal of these blog posts is to try to describe the cognitive and meta-cognitive feeling of research mathematics. The website for this undergraduate class that I taught as a graduate student is here. I was the lead organizer for this summer school, which was run by and for grad students and postdocs in algebraic topology. We used a somewhat unconventional method to determine topics and speakers. For more information, visit the participant wiki: http://2011-wcatss.wikispaces.com/. In the summer of 2011, I taught a really fun math intensive for 7th - 9th graders. We met three days a week, and spent the whole day balancing chaos, curiosity, focus, collaboration, and explorations. I wove several topic threads, each starting from an ancient yet accessible mathematical mystery, and passing through history to a current fascinating, only-slightly-less-accessible area of research. Here's the syllabus and an introductory letter to the students. I took a leave of absence in order to focus on my research. Over 11 weeks I averaged 38 hours/week - and even did 80 hours one week. It was a wonderful, and wonderfully productive time. I recommend it to everyone. Here is a How To guide, with some advice for undertaking your own SMI. My band Branch has made a song based on my PhD research (and a ceiling fan, and the Indian Rag Brindavani Sarang). You can stream the song above, or get the whole album. If you email me a description of "what's going on" rhythmically in the song, then I'll send you a coupon to get the album free. Throughout this website, there are about two dozen short essays about my research and other math, written for a general audience. Here are some about current and past research interests. My PhD dissertation was mostly about this. This is the topic of my General Exam paper. There are also these lecture notes: "Set theory questions in homotopy theory"
At a department potluck, I performed a piece - part theater, part performance art - that told the story of my first "theorem," using music, narration, and lots of bizarre props. My goal was to illustrate some of the common threads in the doing of mathematics that all the mathematicians in the audience could appreciate. The feedback I received afterwards made it seem that I had at least partially succeeded at this. This video performance, embedded on the Home page, tries to simultaneously capture the sustained absorption and isolation of deep mathematical thought, and the whimsy and creativity that blossoms therein. The visual artist is Shannon Wallace. The film was screened at the short film festival of the Bridges 2012 conference, in July 2012 at Towson University. This 142 page book was published in 2009 by Daikon Pickle Productions. The website for this undergraduate course that I taught is here. I organized and ran this seminar investigating the human dimensions of mathematics. The seminar discussions were grounded in the writings of cognitive scientists, philosophers, sociologists, and practicing mathematicians, and brought together grad students, faculty, and staff. In the spring of 2010, I ran a new and improved version, and expanded it to include undergraduates. Here is a description of some of the topics and authors we covered. I also keep a meta-math reference list here. I organized and ran this seminar/reading group in Spring 2008 and Spring 2010, investigating the human side of mathematics. In the seminar, we read excerpts from authors in various fields - cognitive science, philosophy, sociology - as well as writings from practicing mathematicians, examining the mathematical experience and math culture. The seminar was open to and attended by a diverse group -- grad students, faculty, undergrads, and staff. The aim of the seminar was to bring awareness to the personal process of doing math, and to take a critical look at the culture of math. The hope was that by understanding how we do math, we can understand how we do our best math, and thereby become better mathematicians. The two times I ran the seminar, the weekly discussions evolved organically and brought new and exciting sources/references to my attention. In the future I'll be looking into these, to augment the fascinating material I already have found. What Does Math Sound Like? If math was music, what music would it be? Music often complements and augments experience, and the mathematical experience is no exception. Just for fun, I asked my math colleagues at the University of Washington this question, and compiled their responses.